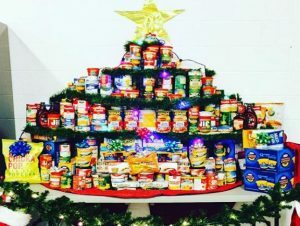 A few weeks back we announced that AMT would be supporting the Central Pennsylvania Food Bank by hosting a Food Drive during the months of November and December. We’re thrilled to report that due to the generosity of our AMT guests and staff, we’ve donated 3,155 pounds of food products as of the end of November. This will put over 2,500 meals on the tables of local families! 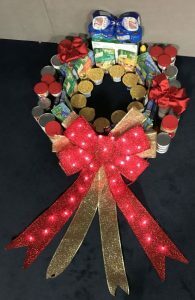 In addition to the incredible amount of donations from our guests, AMT staff also donated and participated in an inter-departmental “Can-struction” challenge. 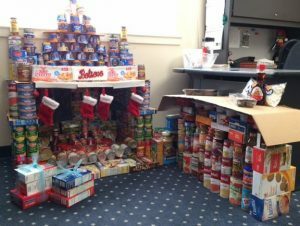 By using the food items their departments donated, along with tons of ingenuity and creativity, their efforts produced Santa’s Chimney along with a milk and cookie table, a Christmas Tree (made with 586 items! ), and a festive Holiday Wreath. See the photos below. AMT will continue to collect food products through the end of our 2016 Christmas Show. Please consider bringing a donation or two if you’re attending the show in December. Click here for a list of the most needed items. To those who have or will participate in AMT’s Food Drive this season, we say a big THANK YOU!